The Safe Kids Worldwide is the first and only national non-profit organization dedicated solely to the prevention of unintentional childhood injury - the number one killer of children ages 14 and under. More than 450 coalitions in 15 countries bring together health and safety experts, educators, corporations, foundations, governments and volunteers to educate and protect families. The organization was founded in 1987 by Children's National Medical Center with support from Johnson & Johnson. Safe Kids Worldwide is a 501(c)(3) non-profit organization located in Washington, D.C. The heart of the Safe Kids Worldwide Campaign's unique approach to injury prevention is the network of grassroots coalitions. The knowledge, energy and commitment of coalition members are valued assets; the campaign's tremendous success in preventing childhood unintentional injury would not be possible without them. In September 2002, Seminole County Board of County Commissioners signed an agreement with SAFE KIDS Worldwide. This agreement helped to form Safe Kids Seminole County Coalition. Safe Kids Seminole County Coalition is part of the Safe Kids Worldwide, whose goal is preventing unintentional childhood injuries. In our first year, fiscal year 2002/2003, the Coalition reached over 2,000 children. Currently Safe Kids Seminole County Coalition is led by Seminole County Sheriff’s Office and is comprised of public, private, voluntary organizations, as well as individuals. To provide education, programs, and awareness about preventable injuries in an effort to keep our community’s children safe from injury. Protect all kids from preventable injuries. Safe Kids Seminole County Coalition is comprised of over 25 Seminole County agencies, Seminole County Sheriff’s Office provides the coalition with a part time Safe Kids Coordinator, office space and operating budget. Safe Kids Seminole County is under the Safe Schools Division. The Coalition meets monthly from 1:30 – 3:00 pm, on the third Wednesday of every month at the Seminole County Sheriff’s Office Community Room,100 Eslinger Way, Sanford, Florida 32773. Community Room. Introduction to Safe Kids Seminole County Coalition. Local business partners are critical in getting the educational message out to our community. Through safety events and educational programs, these businesses help us educate and prevent injuries and death to children in our community. If you have an interest in helping to prevent unintentional childhood injuries and death, then you have what it takes to become a member of SAFE KIDS Seminole County. If you would like to affiliate with Safe Kids Seminole County Coalition, please complete the Safe Kids Seminole County Coalition Membership form and return it to Nancy Norman. For additional information you may call Nancy Norman, Safe Kids Coordinator at 407-665-2604 or 407-212-2378. Safe Kids Seminole County Coalition is continuing to expand our programs to help prevent childhood injuries. These focus areas have ongoing events throughout the year, Child Passenger Safety, Bicycle Safety and Pedestrian Safety Home and Fire Safety and Safe Sleep. Some of our programs are seasonal such as Water Safety, Natural Disaster Safety, Holiday Safety. Each month there is a specific area that we focus on in addition to our ongoing events. See the Calendar at the end of this page. The first Saturday in May, we bring all of our focus areas together for our annual Safe Kids Day a free event for parents and kids at the Seminole Towne Center mall in Sanford. Learn more about Safe Kids Day Worldwide. SAFE KIDS Seminole County urges families to buckle up the entire family when traveling. Buckling up is still the most effective way to save lives and reduce injuries from motor vehicle crashes on America’s roadways. Chances are that someone that you know will be involved in a car crash this year. If they are unbuckled, they’re 50 percent more likely to be injured or killed. Unfortunately, many of those who die will be children; since motor vehicle crashes are still the leading cause of death for children in America. Adults who buckle up send a positive message to their children. In fact, research shows that when parents are buckled, children are buckled 94% of the time. We find when a driver is unbuckled; children riding in the same vehicle are unbuckled. In a 30 mile-per-hour crash, a child riding unrestrained is hit with a force equivalent to falling from a third story window. Community child safety seat check-up events held throughout Florida indicate that 96% of the child safety seats inspected were installed incorrectly. SAFE KIDS Seminole County has a long history of trying to combat these staggering statistics. Each week the Coalition supports a checkup event or fitting station in Seminole County. Bring your car seat for a FREE safety fitting and let certified Car Seat Technicians help you ensure your child’s seat is safely and correctly installed. Parents must bring their car seats, and should also bring their car seat manual and automobile manual. Many parents are unaware that they should refer to the child safety seat and vehicle manufacturer’s instructions for guidance on the proper installation. Proper installation takes a combination of selecting the correct child safety seat for the child and securing the seat to the vehicles. Car Seat fittings are only available at specific locations throughout the county. Firefighters at most Fire Departments are not certified Car Seat Technicians. Appointments are necessary, click on the Car Seat Inspection Stations link for our locations to make an appointment. This program is offered through Safe Kids, Seminole County Coalition members. Heatstroke Deaths of Children in Vehicles, as of August 3, 2018, 733 children have died due to pediatric vehicular heatstroke since 1998. All of these deaths could have been prevented. (b) For any period of time if the motor of the vehicle is running or the health of the child is in danger. The Seminole County Sheriff’s Office Crossing Guard Program, Is the lead Coalition agency for Bicycle and Pedestrian Safety, JoJo Sturm, Crossing Guard Supervisor. For events complete the Safe Kids Speaker Request Form. Each year, over 200 children ages 14 and under died in bicycle-related crashes. An estimated 140,000 children are treated each year in emergency rooms for head injuries sustained while bicycling. Bicycle helmets have been shown to significantly reduce the risk of head and brain injury. In fact, it is estimated that as many as seven out of every eight bicycle related fatalities among children could have been prevented with a bicycle helmet. Although bike fatalities have decreased 92% over the last decade for children under age 15, fatality rates for adult cyclist have increased due to the growing popularity of cycling as a sport and adults that do not feel they need to wear helmets during the recreational family rides. Seminole County’s Safe Kids Coalition believes in providing proper bicycle and pedestrian safety information to youth and adults in our community. Through printed materials, educational courses in schools, and “Bike-Rodeos”, team members provide instruction and hands-on demonstrations. Below are a few safety tips that you can use. The helmet should fit comfortably and not be able to move when you jerk your head from side to side. It should sit parallel to the ground, not tilted back, with about an inch (two fingers) between your eyebrows and the lower edge of the helmet. Make sure the helmet straps are always buckled. The straps should fit snugly, but not too tightly. The sliding clasp on each side of the head should be situated just below the ears. You should be able to put a finger under the closed strap against your neck. Getting the fit "just right" is a matter of trial and error, using the pads provided by the manufacturer and the strap adjustments. Try several helmets in the store; not all helmet styles will fit all heads equally well. Interested in hosting a Bike Rodeo? Click here for more information on how to get a bike rodeo supply kit. Walk across the room for a towel (10 seconds), a child in the bathtub can become submerged. Answer the phone (2 minutes), that child can lose consciousness. In 2013, Florida had the highest unintentional drowning rate in the nation for the 1 to 4 year old age group and the second highest drowning rate in the nation for the 1 to 14 year old age group. Drowning takes the lives of nearly 1,000 children each year. For every child who drowns, four more are hospitalized for near-drowning; for every hospital admission, approximately four children are treated in hospital emergency rooms. Seminole County recorded 2 drownings in 2016 and 2 drownings in 2017. Seminole County Fire Department is the lead Coalition agency for CPR and AED. Seminole County Fire Department offers Hands Only CPR to Seminole County Public Schools and Adult CPR with AED classes. Hands-Only CPR has just two easy steps: If you see a teen or adult suddenly collapse, (1) Call 9-1-1; and (2) Push hard and fast in the center of the chest to the beat of the disco song “Stayin' Alive.” During CPR, you should push on the chest at a rate of 100 to 120 compressions per minute. In addition to the Seminole County Fire Department we currently have one other Seminole County Fire Department, Lake Mary Fire Department Coalition member. Local Fire Departments will also have a Fire Prevention Program. Below is a list of programs that Lake Mary Fire Department offer to their residents and business community. You can click on each item to see the description of that program. If you would like additional information or would like to schedule an event, please complete and submit their Public Interest Form. Seminole County Fire Department also has a Fire Prevention Program. Seminole County Fire Department is pleased to provide our community with several types of Public Education Activities. To request a visit by Seminole County Fire Department, please visit our online Community Outreach Request Form. Every day, children die or end up in the emergency room from the kinds of injuries that commonly happen in homes, such as fires, falls, drowning, suffocation and poisoning. Safe Kids Worldwide has created the following materials, tools and resources to help you keep safe at home. The risk is real: How families can help protect kids. Put all medicine up and away, out of children’s reach and sight. Remember to keep visitors’ purses, bags and coats out of reach, as they may contain medicine. Remember child-resistant packaging is not childproof. So put medicine away immediately after every use, even if you need to give another dose in a few hours. Save the Poison Help number – 1-800-222-1222 – in your phone and post it visibly at home so other caregivers can find it in an emergency. Every 30 seconds a child is poisoned in the United States. Each year, more than 1.1 million unintentional poisonings among children ages five and under are reported to U.S. Poison Control Centers. 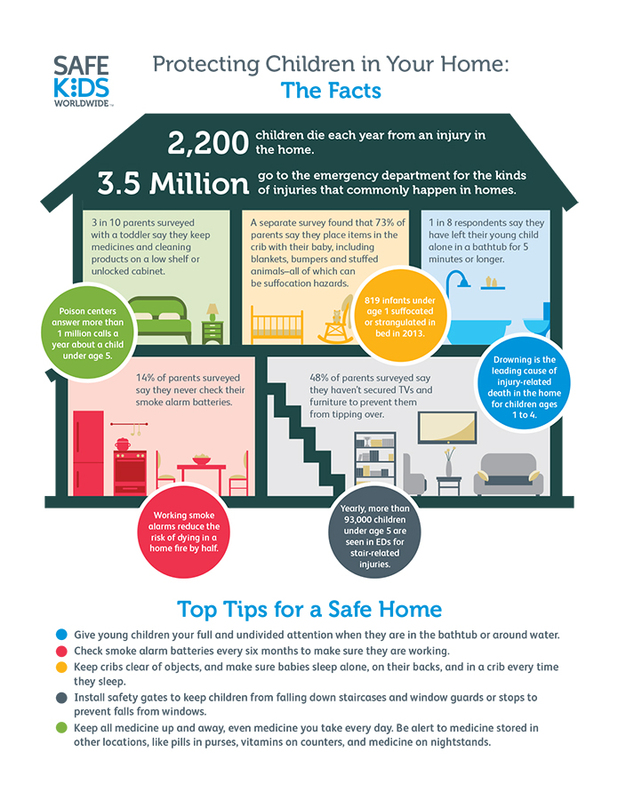 Approximately 92% of all poisonings occur in the home, and 53% involve children under the age of six. Children are at significantly greater risk from poisoning death and exposure than adults because they are smaller, have faster metabolic rates, and are less able to physically handle toxic chemicals. Also, their curiosity and desire to put everything in their mouths increases their poisoning risk. Florida Poison Information Center - Tampa serves on our Safe Kids Seminole County Coalition, and is available for parent organization presentations as well as other Coalition members. The American Association of Poison Control Centers (AAPCC) and the Centers for Disease Control and Prevention (CDC) have established a single number to use to reach your local poison control center. The number is 1-800-222-1222. When you call 1-800-222-1222 from anywhere in the U.S., Puerto Rico, or the U.S. Virgin Islands, you're automatically connected to the nearest poison control center. Every year, 21,000 people visit emergency rooms and more than 400 people are killed due to unintentional carbon monoxide poisonings. Young kids are at even greater risk, with a quarter of all calls to poison control centers due to CO poisonings being for children 19 and under. For additional information contact Nancy Norman, Safe Kids Coordinator at 407-665-2604 or 407-212-2378. To request a speaker for any of the above risk areas please complete and submit a Safe Kids Speaker Request Form.